Locking handle prevents accidental or unintended operation. 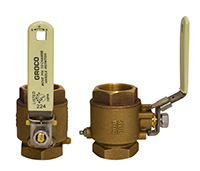 Handle has square hole to accept standard ratchet to help reach valves in hard-to-reach locations and ease actuation of difficult to operate valves. UL listed 15PR for fuel or water.